Fish is easily overcooked, and so the precise temperature control of sous-vide cooking is great to always obtain tender juicy fish that is perfectly cooked. Moreover, vacuum sealing the fish with a marinade allows the marinate to penetrate optimally while the fish cooks. Fish only takes a short time to cook sous-vide, as it only needs to cook long enough for the core of the fish to heat up to the temperature of the water in the sous-vide. This time depends on the thickness of the fish: about 5 minutes for 0.5 cm (.2 inch), 20 minutes for 1 cm (.4 inch), 35 minutes for 1.5 cm (.6 inch). 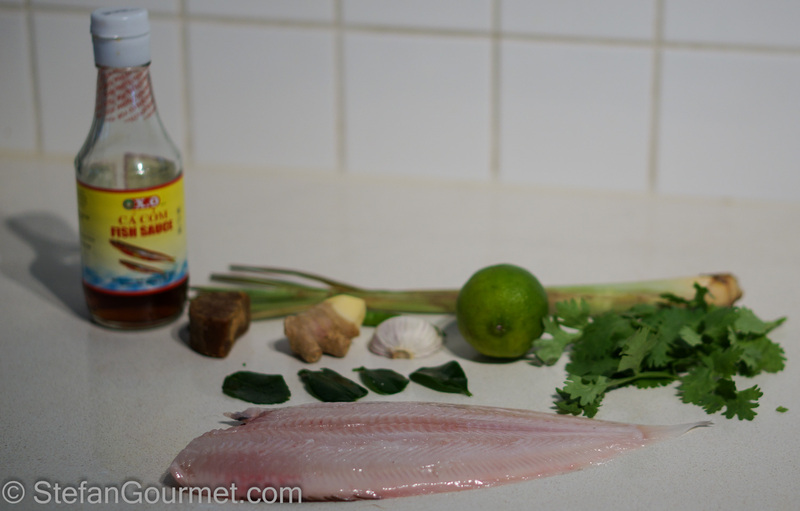 Slice the lemon grass, ginger, and lime leaf. 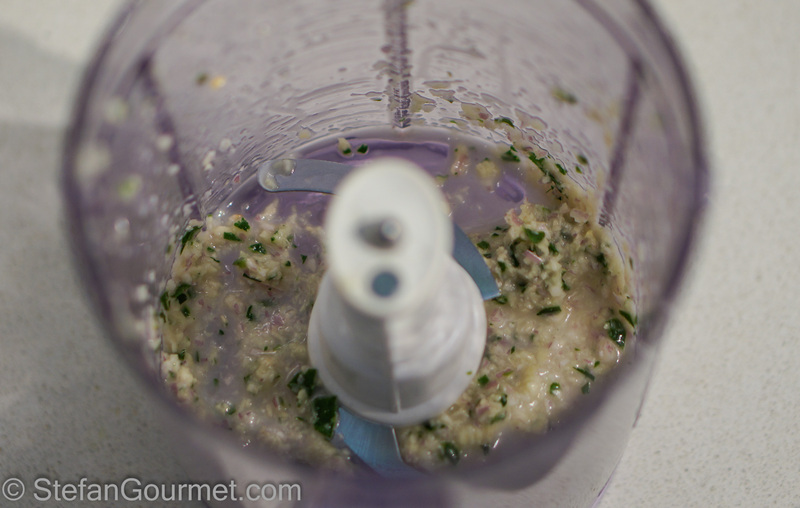 Use a blender or pestle and mortar to grind this into a paste. 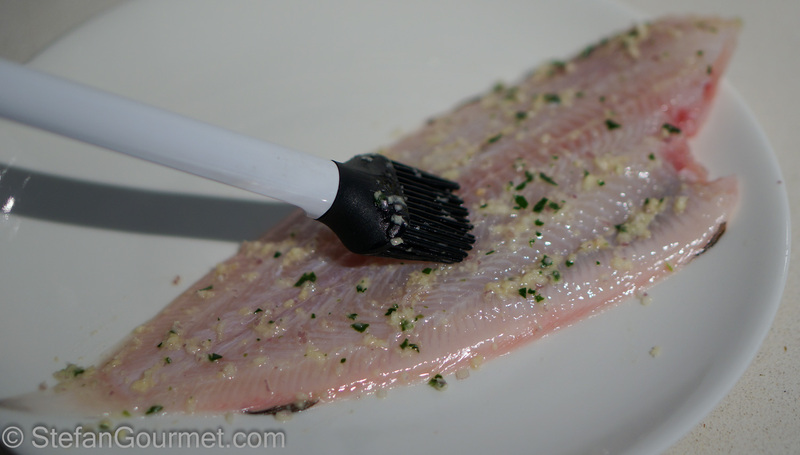 Brush the paste onto the fish. Vacuum seal the fish and cook it sous-vide for 15 minutes at 50ºC/122ºF for a whole fish or 10 minutes at 42ºC/108ºF for fillets. Because of the precise temperature control it is fine to leave the fish in a bit longer, up to half an hour shouldn’t make a noticeable difference. 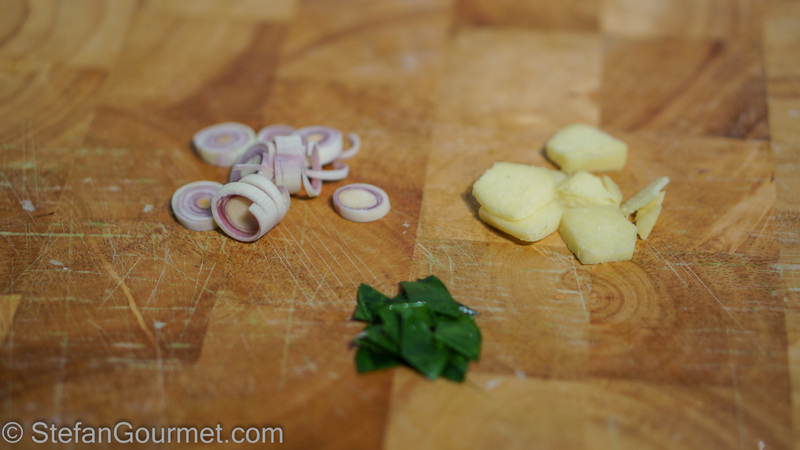 Meanwhile, prepare the dressing by combining the ingredients in a small bowl and stirring until the sugar has dissolved. 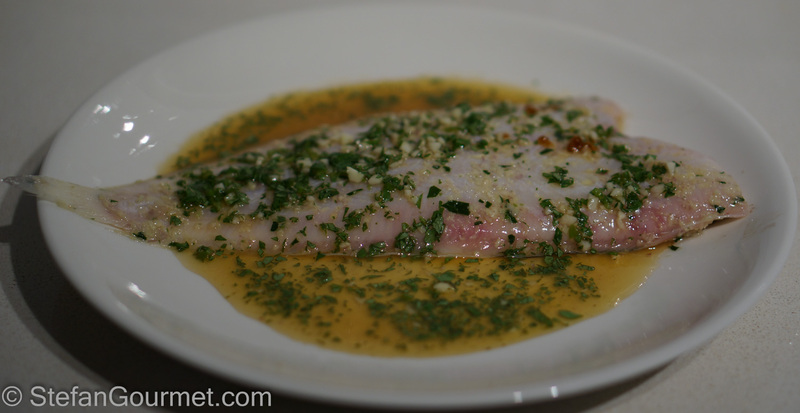 When the sole is cooked, put it on a preheated plate and pour over the dressing. Because of the low cooking temperature and dressing at room temperature, preheating the plates is very important. 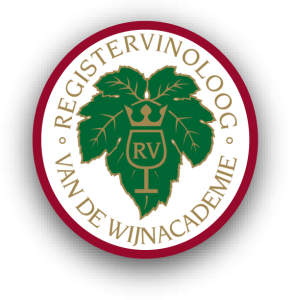 This is great with a crispy dry white such as many types of sauvignon blanc. Dashi is the cornerstone of Japanese cooking. By extracting the flavors of the konbu seaweed by sous-vide cooking, it is easier to achieve the delicate flavor that is characteristic of outstanding dashi. This looks so good. Wish I could get my hands on kafiir limes. Guess I could try to grow one! 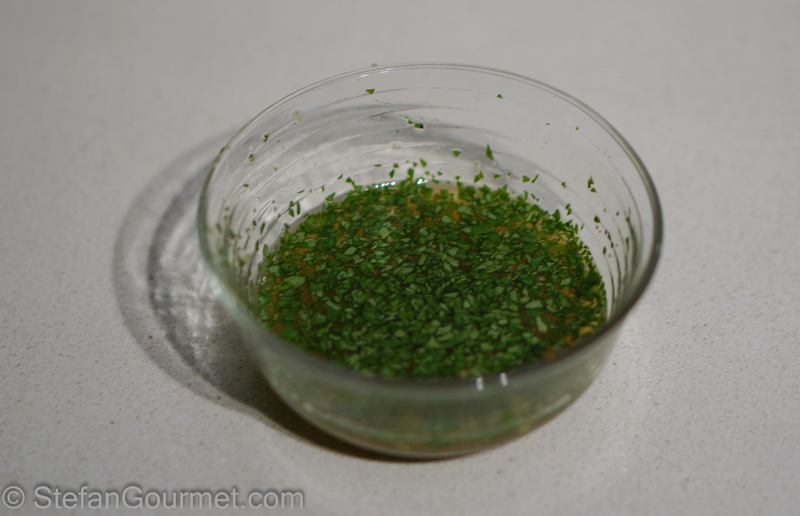 Do you think sous vide’ing with a marinade helps infuse the marinade flavors? I’ve always wondered this. I buy lime leaves frozen, so I suppose it should be possible to order them online. I do believe that sous-vide cooking with a marinade will allow the flavors to infuse, but I’m planning to do some experiments to confirm. You could of course also wait for an hour or so after vacuum sealing to allow the flavors to infuse even more. okay – good to know. I guess you could always wait a day before sous vide’ing. I am new to sous vide cooking and came upon this site via a google search. Very interested in exploring the potential of SV cooking. but thought i would just post that I have a kafir lime tree in my garden and it is abundant with leaves, if anyone wants some i can vacuum pack them and send, not sure how this works, but the offer is there if anyone is interested. Thanks for visiting and your kind offer of kaffir lime leaves. 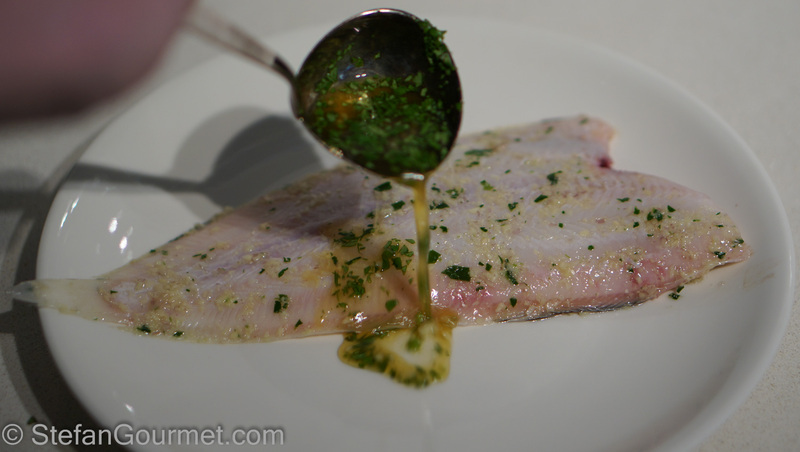 I’m sure you’ll enjoy sous-vide cooking and hope to see you around here often. If you have any questions about sous-vide cooking, please don’t hesitate to ask. Hi Larry, thanks for visiting and taking the time to comment. I prefer fish and meat to be cooked ‘medium rare’, but you can certainly go as high as 122F for sole if you prefer it slightly more cooked.